I sent out a couple acres units to attack someone on the other side of the map to see how the merging process might work but it won't let me recall any of them even when i pull it up from their acres page. Not only that but they didn't merge either so i essentially just wasted 600 agents and soldiers that will have to attack separately. As for the "it won't let me recall any of them even when i pull it up from their acres page.". You should be able to recall any attack convoys. 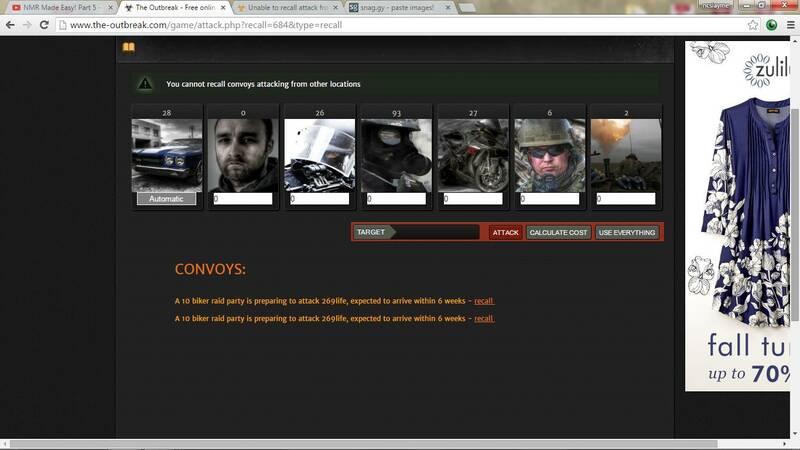 Recalling troops is done on the Attack page or in the info box when you hover over your convoys on the map. The recall troops button on the Acre page is only for troops stationed there, not for attack convoys. So what happens if you lose the Acre(s) you launched your attack? Do the recalled armies return to town? I don't care to repeat the experiment as i lost quite a few troops due to starving them out last time, but click recall on any of them just prompted the message. "you can not recall troops from other locations" from the map, the attack page, or from the attack page on the acre. The merge message is nice to know but I'm not wrong about the recall part the same thing happened to one of my clan members earlier this round. No matter what i tried this is the error it prompted up... I would just post the picture but it doesn't seem to be working for me. Thank you for reporting this issue, we are going to look into it. Thank you again for addressing this issue to us. Meanwhile we have put a update online that should resolve this problem. Thank you, I wasn't entirely sure if that was a glitch or a strategy concept that I didn't see in the guide.